The acoustic method uses directional hydrophones that 'listen' for ultrasound generated by leaking fluids under pressure. The acoustic signals generated by a leak tend to be at frequencies above 50kHz. 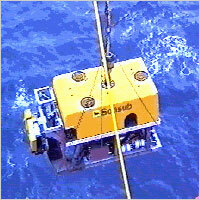 The software uses techniques that determine the difference between leak generated sound and lower frequency noise such as that caused by the attendant ROV and surface vessels.